Come take a time out from what ails you, in the lovely Blue Ridge Mountains. When you need an attitude adjustment, find yourself at Altitude Adjustment. This 3-bedroom, 3-bathroom newly constructed log home comes fully equipped with fresh air and mountain views - just what the doctor ordered! Upon entering the front door, you'll be in awe of the architectural details and touches. Mountain Laurel adorns the stairways in this unique and charming mountain escape. No expenses were spared when creating this vacation home. The kitchen has beautiful granite countertops and stainless appliances. Sizeable flat screen TVs can be found in the Master Bedroom on the upper level, in the Living Room, and in the Lower Level Recreation Room. On the entry level, this cabin offers an open floor plan with seating for 4 at the breakfast bar, and 6 at the dining room table. The living room is dressed with plush furnishings, a gas fireplace and a 50" Flat Panel TV. Walk through the living room and out the door to the screened-in porch with an outdoor wood-burning fireplace, where you can enjoy the great outdoors without the elements hindering you! Back inside on the entry level is a King Bedroom with a bathroom across the hall offering a tub/shower combo. Continuing upstairs and through the sitting loft, to find the Master Bedroom - A King bed with a 40" Flat Panel TV and an attached bathroom with a stand-up, stone, tile shower. Come all the way down to the lower level and find a grand recreation room equipped with all the necessities; comfy furniture, a 70" Flat Panel TV, wet bar, table shuffleboard and a bar table. Perfect lounging material, right? Just outside the door is the lower level deck, where the hot tub is located. Back inside, the lower level offers a 3rd bedroom with a set of bunk beds (Queen on bottom, twin on top). A bathroom with a tub/shower combo is also found on this level. It's clear that whether you are planning a romantic retreat or a weekend getaway with the family, you can find what you are looking for in the Blue Ridge Mountains at Altitude Adjustment. Incredible team making it simple in all facets of reservations to check-out process! Unbelievable accommodations, setting/views, and proximity to downtown, Orchard, Mccaysville, waterfalls. Fantastic! I had a very good experience with Amy (I think that was her name)prior to my stay. Would have loved to have met here. Blue Ridge was the perfect weekend getaway with my family. We couldn't have picked a better house. We have stayed in Mountain Tops in the past, but prefer South Toccoa Estates. This is a gated community on the Toccoa river, but you are still in mountain, and can enjoy both. Check in was very easy and the staff was very informative. The young lady that checked me in was so sweet! It was one of the nicest a cabins we have ever stayed in! We have stayed in a lot of cabins in Blue a Ridge before, some were very nice, but Altitude Adjustment wins with us!! Friendly, very willing to discuss needs and were clear. The property's was well-maintained and clean. The environment was serene. It exceeded expectations. Everyone is great and friendly. This is second time using this cabin and management company and will book again for next year's 2 trips. BEAUTIFUL Cabin and WONDERFUL private getaway with INCREDIBLE mountain views! This is by far the best cabin to stay at in the Blue Ridge Mountain area! Gorgeously decorated, high-end furniture and furnishings, well-maintained and clean, all in the coziest of settings! 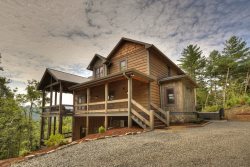 The cabin is nestled in the middle of the mountains, yet easy access to shopping and sightseeing! We LOVED the screened in porch with the wood-burning fireplace...family fun, smores galore, all while listening to the bustling river and mountain wildlife in the distance. Theres so much room in this cabinincluding gourmet kitchen, multi-level bedrooms and bathrooms, two great rooms, two fireplaces, a large/open recreational area on the terrace level, with games, big screen TVs, shuffleboard table, and Jacuzzi! This is the perfect cabin for either family fun or for a romantic excursion! Well definitely be booking future trips to this heavenly haven! Staff is so easy to work with and the entire process of checking in and checking out is a breeze. Good job to all. Awesome property. When we got home we went to book it again for the end of January, but sadly Altitude Adjustment was already booked, but we found another cabin that we reserved already. Georgeous cabin. Wanted to buy this property! We arrived late due to traffic we encountered in Chattanooga. The staff worked with us setting up our late arrival. The staff was also very helpful before we came when we contacted them with some questions. Overall the stay was very good. We enjoyed the cabin and the area. The only issue we had was the first night we were there......we killed two very large spiders in the basement bathroom and during the night we heard loud thuds off and on throughout the night. We realized later it was acorns falling from a tree hitting the metal roof. We would stay again for sure. The Southern Comfort Cabins team was easy to work with and very accommodating. Altitude Adjustment is as beautiful as the pictures. It was very clean and well appointed. The view is relaxing and the sunrises were spectacular.